M.P.F.F.A. 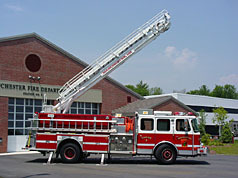 | Station 8 E. Industrial Ave.
65 foot telesquirt electronically or radio-remote operated)with a vertical reach 65 ft. and a horizontal each of 60 ft. The department accepted a second forestry truck to be stationed at the Cohas Brook Fire Station. 2003 Ford F-550 all-wheel drive with a 17,500 GVWR pkg. Staffing at Station 8 does not copmply with National Staffing Standards.